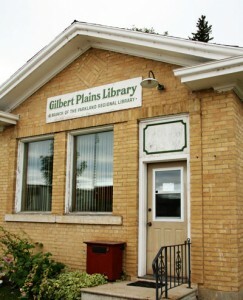 The Gilbert Plains Library is part of the Parkland Regional Library System, which holds 124,000 books in 18 branches. While there are approximately 4,500 books at one time in the Gilbert Plains branch, most of these are rotated four times throughout the year with over 14,000 books passing through the branch. The local collection also includes magazines, talking books and video blocs. In addition, the Gilbert Plains Library has two computers with Internet connection available for public use. For more information, contact the Gilbert Plains Library at 548-2733. Tuesday 1 p.m. to 5 p.m.
Thursday 10 a.m. to 12 p.m. & 1 p.m. to 5 p.m.